THE Earl of Wessex is to open the Isle of Wight Literary Festival at Northwood House, in Cowes, on October 14. 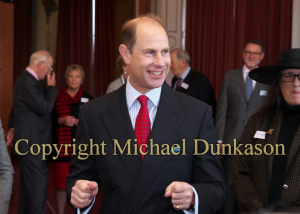 Prince Edward will meet organisers and trustees, who will explain the origins of the festival and the programme of events before being introduced to volunteers and visiting Blackwell’s Book Shop and the Jazz Cafe. The earl will then visit the Royal Yacht Squadron, also in Cowes, and trustees of the IW Foundation, which he is a patron of. The royal will then travel to Newport to visit Newport Minster to discover how restoration work is going and then he will stop at Isle of Wight Radio. There will also be visits to Quarr Abbey and Brading Roman Villa. Lord Lieutenant of the Isle of Wight, Maj Gen Martin White, said: “We are very much looking forward to welcoming The Earl of Wessex back to the Isle of Wight.